Rescuers are seen entering a building that collapsed onto its side from an early morning earthquake in Hualien County, eastern Taiwan, on Wednesday. The quake's magnitude was 6.4. A series of earthquakes is rocking Taiwan, leaving two dead and more than 100 injured, according to The Associated Press, which cites Taiwan's premier, William Lai. The latest AP tally reports 144 people injured. Four buildings have collapsed and one bridge has been damaged, Taiwan's National Fire Agency told ABC News. The largest quake so far was reported at 11:50 p.m. Tuesday night local time, registered at magnitude 6.4 by the United States Geological Survey. The Central Weather Bureau, which tracks seismic activity in Taiwan, reported the epicenter of the earthquake was at sea about 18.3 kilometers (11 miles) north of Hualien City. 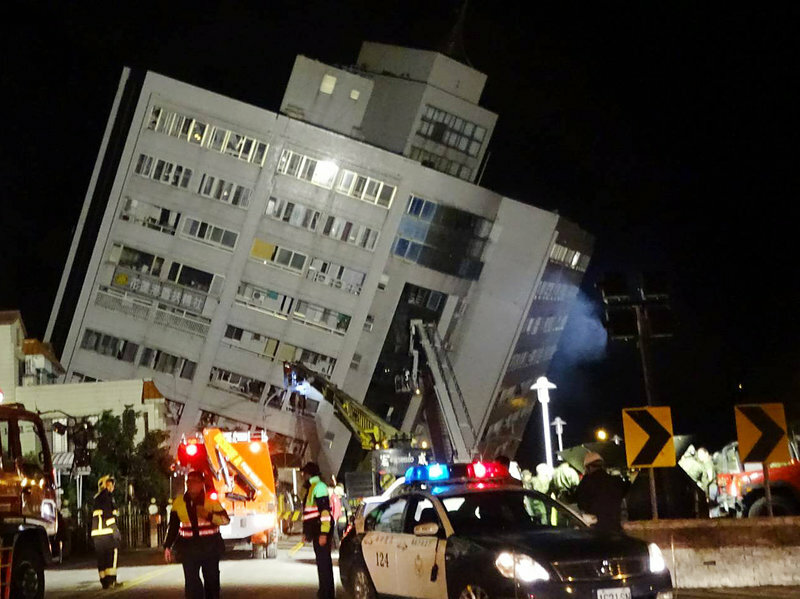 The Central News Agency reported that the ground floor of the Marshal Hotel, a building in Hualien district, had caved in and people were believed to be trapped inside. According to ABC, "there were over 100 guests in the hotel at the time of the quake, and at least three people remain trapped, the department said. Firefighters are continuing to deal with gas leaks and fires as a result of the quake." And, the AP says, Taiwanese media reported that a separate hotel known as the Beautiful Life Hotel is tilting. Compilation footage posted to Twitter by the China Global Television Network shows a building tilting on its side over a line of cars parked along the street. People can be seen running down the street, carrying ladders to climb over the rubble and reach people still inside the collapsed building. Another clip shows the damage caused inside a store. A handful of employees race out of frame as merchandise is shaken off the shelves and onto the ground. Don Blakeman, a geophysicist at the National Earthquake Information Center, says the temblors have continued into the early morning hours on Wednesday. There have been three aftershock quakes over 5.0 so far. And, he added, these are just the latest in a series of quakes that began last week. The AP reported the 6.4 tremor followed one over the weekend off the coast of Hualien, which lies along the famed Ring of Fire known for seismic activity that circles the Pacific basin. 0 Response to "6.4 Magnitude Quake Hits Taiwan, At Least 2 Dead"